After 3 years of working here, at Office Reality (I know, doesn’t time fly?) 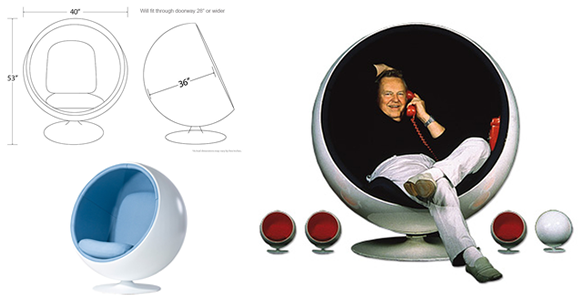 and always having a huge interest in furniture and interior design, there is one chair that has never been far from my mind- the Ball Chair. Unconventional and simple in design, the fibreglass ball is built on a metal swivelling base and upholstered inside with foam and fibrefill. The original fabric colours were black, orange, red and white. The main aim and purpose for the chair was to create a “cosy and calm atmosphere” that protects the user from outside noises and gives them a private space for relaxing. The type of environment that would be ideal for a phone call as telecommunication was a fast growing opportunity for the majority of the population during the 1960s so the timing of the chair was perfect. Much like Porky Hefer’s Black Hole, the chair was designed to create a space where you could get comfortable, sitting within your own little World. A space where you could have time to reflect, think and relax. It also created a superior feature point within the living room space. Functionality and style, definitely my type of chair! 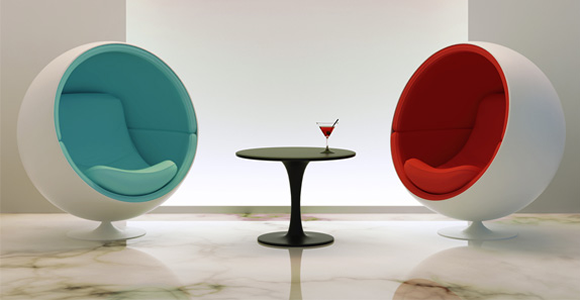 The Ball chair was designed around modern, everyday situations with the use of modern materials and technologies. It is almost like the chair has represented the modern times that the 60s generation found themselves in- a period of fun and change. Since being presented at the International Furniture Fair, Cologne in 1966 the Ball chair has received well deserved praise and recognition, becoming an instant success within the design and furniture industry. The original chair is still at Aarnio’s home and includes a telephone that sits within the chair itself. People have been known to have integrated speakers as well! You would never have to get out of your seat! Aarnio remains one of the pioneers utilising plastic within industrial design. Over the years he has shown the freedom of possibilities that designers can achieve with plastics and fibreglass materials, moulds and shapes. Now often seen in films, TV shows and magazines, the Ball chair has become one of the industry’s favourite timeless classics. If time continues to fly past like it has done over the next few years, you will probably being saying the same about me here at Office Reality!